One of the things that really irks me is people trying to take credit for things they did not do. 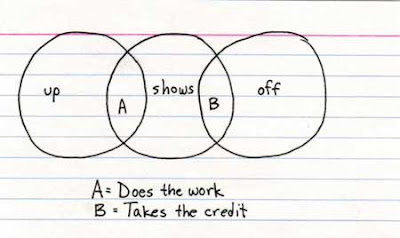 I suppose it is human nature, as we all love success, but when others - and particularly politicians - try to claim credit for things they did not actually accomplish it drives me bonkers. And so it was last night on Twitter when I noted an opposition MLA in the provincial government was trying to claim that pressure from the opposition helped to force the twinning of Highway 63. This is such a preposterous claim, and today I will show you why. People in this region have been clamouring for the twinning of Highway 63 for years, and long before the formation of the party that is now in official opposition. The real push to get it done, though, came almost one year ago now on a day in April when seven people died in a horrific collision. The provincial election was just over, the ink not even dry on the papers reporting the win by the Progressive Conservatives. The government had not yet even had a session when this accident occurred, and I suspect many didn't even know where their offices were. But something did happen after that accident, and it wasn't an uprising from the official opposition. It was an uprising by the people of this region. The credit for securing the commitment to twin Highway 63 should not go to the parties in opposition in the provincial legislature. I did not see one of them at the Twin 63 Now rally, a rally that drew numbers unprecedented in this region, and that showed a social activism we have not really witnessed here before. They did not plan that rally, they did not invite the media to it, and they did not fight to make it happen. Two young women named Ashley St. Croix and Nicole Auser did that, and thousands of people came to that rally on a busy Saturday afternoon in May. I know because I was there, too. 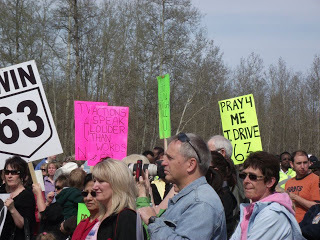 I did not see the opposition parties start petitions that garnered thousands of signatures, signatures of those who demanded to see a commitment to twin Highway 63. They did not drop those petitions off at local businesses, and sit at events with a pen in their hand asking every passerby to sign them. That was Annie Lelievre, the mother of a young man lost on Highway 63. She fought tirelessly to see the commitment to twin Highway 63 made. I know because I know Annie, and I saw how hard she fought, even when it seemed she had no more fight in her. The opposition parties did not write thousand of emails or letters to those in power demanding the twinning of Highway 63. They did not start websites devoted to those lost on the highway. They did not shout out to the universe that this needed to happen, and that it needed to happen now, and that if it did not happen that they would continue to shout. No, that was not a group of politicians who did that. That, people, was us. Do I think some credit should go to our local MLAs, Mike Allen and Don Scott? Yes, I do, because they carried our voices to the legislature, and they were able to share our anger and pain with their colleagues. They were able to act as the messengers for our demands, and they undoubtedly played a role. But the real credit for securing the twinning of Highway 63 should not go to politicians, and I will never allow them to take credit for the work of Ashley and Nicole and Annie and the thousands of others who truly made this happen. The real credit for all of this goes to you, the people of Fort McMurray and beyond, the ones who wrote letters and attended rallies and signed petitions. The real credit must go to the people. One day in 2016 I hope to be there when they open the newly, and completely, twinned Highway 63. I want to be there for two reasons, you see. First, that little ribbon of road has become intertwined in my life, a topic I have written about, talked about, thought about, and cried about more often than I care to admit. And second I want to be there when a politician of any stripe tries to take credit for making it happen (let alone politicians who didn't even show up at things like a memorial rally). I want to be there to remind everyone that in this case the ones who made this happen were not politicians or industry executives. I want to be there to remind everyone that the credit for this life-altering event (and it will be life-altering for those who have their lives saved by twinning, although they may never even know it) belongs to the people of Fort McMurray who made it clear that they would not stop and would not give up until they saw it happen. This was not about elections and votes and promises and false political outrage over an issue - this was about a community that had seen enough crosses, heard the siren of enough ambulances, and cried enough tears. This was about an entire community that came together to make something happen to save lives - and I will fight to make sure that they get the credit that is due to them and not see it stolen by someone wishing to score political points. The commitment to twin Highway 63 was not a victory for government or opposition or any other political party - it was a victory for the people of this region who made it happen. And I would suggest that anyone who thinks otherwise - or who tries to take credit for it - should reconsider, because I will be happy to remind them of who should really be taking credit on Highway 63. So well articulated and very eloquently stated, Theresa! I felt immense pride while reading your article, knowing that I have been a part of this movement started by Annie, Nicole & Ashly as well as the thousands of people not only across our Region, but our Province , our Country and Internationally, who clearly advised the Alberta Governemnt that enough was enough and their inaction to twin 63 would no longer be tolerated. 40 years here and this was truly one of the proudest moments for me! I felt sad that Guy Boutilier as or MLA fought so hard for so many years to get this highway twinned during his term in office and one voice just could not be heard above the Central and Southern MLAs. When he stood up against the the Big Boys on behalf of the RMWB Constituents, he got ousted from the Party in Power. Sadly enough, it was the accident last April which created such an outcry and brought the people of this community together. You are right Theresa, we had two brand new MLAs who rode on the tails of the public outcry to Twin a Safer 63. My Question is whether they did anything at all. We did not need them to have our voices heard ... they did not speak to the twinning of 63 before they ran for election, they did not fight for this in Legislature since. I firmly believe that Mike & Don jumped on the People Train to garner recognition and bask in the limelight of Legislature, which had begun to feel a lot of heat! Neither MLA had to do anything but smile, and regurgitate the Legislative responses to the 'Twin for a Safer 63" uprising. Don & Mike should be thanking the people for making their jobs so extremely easy as they stepped into those tight new new shoes. The people have nothing to thank Don or Mike for when it comes to Highway 63 and they are both supporting the government to repeat the same erroneous mistake of inaction again with regards to Highway to 881. The 'people Canada-Wide' fought for this, all led by a small Community's Rally of Support & their Determination to have a Safer 63! I agree with you Theresa, that No Politician in this region or any other can take credit for this, it belongs 100% to the power of the 'People". Thank you, Theresa, for your acknowledgement and recognition of the women whose strength, commitment & determination, started a movement which grew to include people at an international level and brought a Community together. Thank you for akcnolwedging the many thousands who supported them back then, and those who continue on now almost a year later. WE the PEOPLE will remain dedicated to standing together to ensure the necessary improvements needed, to make a Safer Highway 63 and a Safer 881, are implemented. Like you, I take pride in a Community that came together to achieve what appeared to be the impossible. It is equally important that the credit should go to those who deserve it. Thank you once again, Theresa, for this riveting article of frankness, recognition and support to the people and this cause. YOU are part of the "People"! As to the role of Don Scott and Mike Allen -I do know they did "something" as I witnessed it first hand. I know they attended the Twin 63 Now rally as I spoke with them there, and I attended a meeting where they discussed this issue with their colleagues. Both did discuss the urgency of twinning Highway 63 during the election campaign, and I am familiar with that as I was present when it happened. So while you may believe they had no role to play I do differ as I think they did play a part - the part they played was to represent their constituents to legislature.I do believe the majority of credit, however, must fall to the citizens of this region - although it should be recognized that both our MLAs also happen to be citizens and residents here as well. Don and Mike are my friends and I know how hard they did their jobs and that should not be forgotten in this. I read all of the blog and response and need to say this: They did their jobs. They took the message that the people told them to take forward. The media has to take an extremely large part of the credit I believe because I believe it was the attention and the response from those out of our Region that made the Government take attention and deal with it. The movement started by these three brave ladies and the press that reported it and pushed it into the spotlight created a situation where the MLA's of all Regions had to take notice. Suddenly Alberta was exposed to allowing a horrible situation to continue. Those in politics know that inaction when this occurs is a death blow. Highway 881 is not there yet, but our hearts lie there. We need to finish one and then champion the next one. To divide the attention now could severly affect the commitment to 63 and that would not help anyone. The people from the rest of the world who helped us are not there this time. Unfortunately, neither will the political will be. Those MLA's who represented the other Regions will not be there. THIS is the reality of politics or the Ugly Truth. I believe it is the perfect time to draw attention to the fact that the needs of our community have been ignored for far too long! Turning the attention to Highway 881 and the situation with our Emergency Medevac Services , while keeping the government Accountable for twinning of 63 definitely demonstrates just how long this community has been ignored. We cannot allow them to make the same mistake with 881 as they did with 63. Something Mike and Don are in agreement with ... waiting until later. We all know where that goes ... 10, 15, 20 years from now! People are righfully angry and disgusted with the lack of response to the needs of our Industry driven Community and the Provincial greed for $ which continually are going elsewhere, ahead of the people who live, work and commute here. NOW is the time. We will have to agree to disagree where Mike and Don are concerned as they are in the unenviable position of not owning personal thought anymore. CTV News announced today that 'everything the Alberta PC MLAs say must be 'vetted' through Government Communications ... what does that tell you. There is no comfort in knowing our MLAs have no voice of their own lket alone of the people they represent. I want to know what my MLAs have to say and think about the issues impacting my community, not what their peers and Party Leader say or think. Hmmm ... I would rather have an Independent representing me if they are representing my community's values and visions. My community is caring, giving and dedicated to the needs of the municipality we live in. They are standing up for those values and visions and it is something to be very proud of. That is what I want to see in my MLAs. I'm not sure it really matters who gets credit, and if we do take the credit we should also take the blame for sitting on our hands and allowing six years to pass before we spoke out. On April 27 seven people and and unborn child lost their lives. I have asked myself many times, where would we be in the fight for twinning if those people had not died. It was the public outcry that forced the politicians into action and nothing else. Seven people had to lose their life to make it happen. Annie was alone in her fight on April 26th. She had less than 1000 signatures. I think the question shouldn't be who gets credit. It should be where were we all on April 26th? Why does it take a horrific event to make people care? I think most residents wanted the highway twinned and as I noted had been clamouring to see it happen for years - the collision in April was simply the straw that broke the camel's back, the moment when anger and sorrow reached the zenith. My point is that if anyone should get credit then it should be those who deserve it (being the people who demanded action) as opposed to those who show up later hoping to "cash in" on the victory. I think in the end it is human nature to be spurred to action by one horrific event that captures their attention. Perhaps it should not be that way but if you look at history I think it reflects this theory as often years or decades of horrible things go unnoticed until there is one cataclysmic event that changes everything. You have a very valid point, Theresa. Those who had clamoured for years went unheard and although our MLA repeastedly fought for this communities wants and needs, he was ignored by the Urban clusters of MLAs. To the point when even he could no longer tolerate the inaction, he was ousted and forces to the back benches as 'punishment'. People became frustrated due to the apathy of our Provincial leaders and the fact that they 'punished' our reprentative for not 'falling in with the majority'. I agree with marlen that as citizens we are partially responsible for not speaking out louder, even then. But while this horrible accident which took 7 lives (8) brought the people to thier feet, we are determined that those lives lost and all those before them will not have been lost in vain. They counted! All of them, and the many more that have and will follow. We will no longer look the other way. You are also correct in that one catalclysmic event can change everything, and it is up to all of us to ensure that it does. On a final note, just let me say one more thing.If we all followed the idea that history repeats itself most people in this community would stay apathetic. History also shows that it is never too late to take back your power and use it to achieve the impossible. No one really cares who gets the credit in this case ... except a few politicians and their followers. The rest of us just want to see the end result of our efforts. Have a great day everyone and be proud of your contributions to this community. I think Mike and Don cashed in as well being that the public outcry was already there. I also think it is without merit to state that the opposition did not help in anyway initially. They were the ones who invited Annie to the first sitting as well as the ones that presented her petition to the house and spoke out many times in the media as to why the twinning was taking so long. Why did Annie's own representatives from her community not invite her to the first sitting and present her petition to Government? You can think it is without merit but did any opposition members, of any party, attend the Twin 63 Now rally? I do not believe they did(and for the record Don and Mike did). Yes, Annie's petition was presented by an opposing party - but not by the official opposition, either, but by an NDP MLA.The party attempting to claim some credit is the one who did not show up at the rallies, organize petitions, present the petition in the Legislature, or introduce Annie. And yet they have MLAs trying to say they deserve some credit? I do indeed find that objectionable. If the criteria for being considered helpful is attending a rally, then you are right. The NDP may not be the "official" opposition party but they are an opposition party as well. I find it extremely objectionable that one of our own had to go to an opposition party to have a petition regarding such a serious issue in our community to presented to the Government. I'm not trying to say that the comment made or who made it was right. I'm just stating that Mike and Don are getting far too much credit for attending a rally when other parties did much more to bring our communities voice to the Government. Which is your opinion, and you have the right to hold it (and I have allowed you to state it on my blog). My opinion happens to differ and I have no intention of changing it or of arguing it further with those who seem intent on further politicizing the issue when my entire point was that the vast majority of the credit needs to be given to the people and not to politicians. I do believe Don and Mike had a role to play which they did, and I do believe the majority of the credit belongs not to them but to the people of this region, which I stated. Repeatedly. I am sorry if I have offended you and thank you for allowing me to state my views on your blog. I was not trying to politicize the issue. My point was simply to say that the opposition parties were there initially as your comment in your blog said they were not. At the risk of delving into politics, I will credit our MLA's with having done something if and when the highway is actually twinned. Commitments and encouraging for sure, but talk is easy. Quite rightly, you give credit to the people of Fort McMurray. Its refreshing to see what the power of people can accomplish rather than waiting on politicians to decide if they are wearing a heart on any particular day or merely a political weather vane.